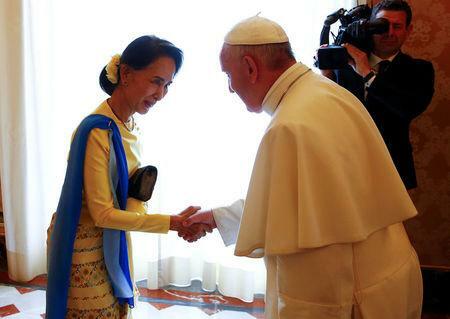 VATICAN CITY (Reuters) - The Vatican and Myanmar established full diplomatic relations on Thursday, minutes after Pope Francis met with the country's leader, Aung San Suu Kyi. The surprise move means that the Vatican will have much more diplomatic influence in Myanmar, which is facing international scrutiny over atrocities against the Rohingya Muslim minority. There are about 700,000 Catholics in Myanmar according to the country's cardinal, Charles Maung Bo, out of a total population of some 51.4 million, the majority of whom are Buddhist. The Vatican had previously been represented in Myanmar by an apostolic delegate to the local church who was based in Thailand. The move means the Vatican and Myanmar will each appoint a full-fledged ambassador. The announcement came shortly after Pope Francis met Suu Kyi, the de facto leader of Myanmar's civilian government and also its foreign minister. Suu Kyi assumed power in 2016 following a landslide election win after Myanmar's former military leaders initiated a political transition. On Thursday, Francis gave Suu Kyi a copy of his 2017 message for the Church's World day of Peace, whose title is "Non-violence: a style of politics for peace". His remarks in February came shortly after a U.N. report that said security forces in the north of the country had carried out mass killings, gang rapes and had burned villages. On Tuesday, the European Union clashed with Suu Kyi by publicly supporting an international mission to look into alleged human rights abuses against the Rohingya. She said Myanmar was "disassociating" itself from the resolution.